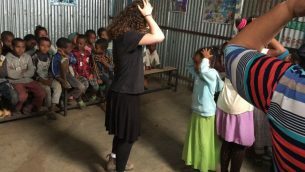 5 Days With the Jewish Children of Ethiopia – Satenaw Ethioopian News & Breaking News: Your right to know! 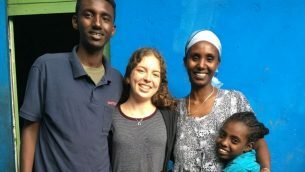 Post Israeli army volunteer experience in Ethiopia leads to cultural bonds. 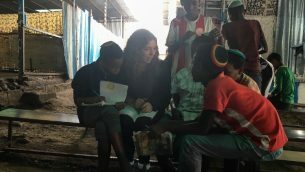 Dalia Hartstein teaches Ethiopian children some Hebrew songs. In August I flew to Ethiopia with my friend Adi to volunteer with the Jewish community in Gondar for five days. We joined 10 Israeli post-army volunteers who ran a camp for the kids in the compound throughout the summer. Gondar is a village in Ethiopia with one paved road, mud houses and animals wandering the streets. Gondar has 5,000 Falash Mura Jews waiting to make aliyah. Many have been waiting for years, and some have immediate family in Israel. More than 1,000 children of all ages attended the camp in the Jewish compound, which consists of outdoor benches and several “rooms” divided by corrugated metal walls. Many of the walls are painted with Stars of David, and there is a large area where they pray three times a day. 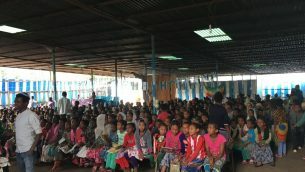 Over 1,000 kids, ranging in age, attend the Jewish camp in Ethiopia. From 8 to 11 each morning we ran activities for the youngest kids, approximately 50 of them who were around 6 years old. We were joined by a talented 52-year-old Israeli volunteer who used to be a pre-K teacher and three Ethiopian teenagers, who translated and helped us manage the kids. We taught them a bunch of songs in Hebrew, along with hand motions that corresponded to the words, danced with them, and did other activities. Adi and I had an amazing time. They were so cute and well behaved. They waited patiently for their turns and sat right back down when we asked them. Hartstein teaches Hebrew songs to children. They — the teenagers as well as the little kids — got excited about the simplest things. For example, we gave each of them a small ball of Play-Doh, and they played with it for half an hour, making different shapes and animals. We taped a rope to the floor, and they had to walk across it as if it were a tightrope. In the afternoons, activities and classes were held for the older kids. On one of the days I had to teach five 18-year-old boys the alef-bet. It was slightly challenging for me, but I made sure to keep it interesting. I made up a game that helped them remember the letters, and we played it over and over. I was amazed at how eager they were to learn. They wrote down everything I taught them in individual notebooks that were handed to them at the beginning of the camp. Each kid cherished his notebook. In addition, one time (out of many) a kid came up to me and asked me to teach him English. I started out by teaching him how to answer basic questions about himself. Before I knew it, I was surrounded by seven kids learning English. Hartstein teaches English to children using basic questions. A special experience was going to Hermes’ house. I met Hermes the first time we were in Ethiopia as a family, and we really connected with him. He is in charge of Bnei Akiva in Gondar, finished at the top of his class in school last year and speaks fluent Hebrew. On the last day Adi and I were there, he invited us to his home. We entered his one-room house and sat on a mattress on the floor where he sleeps. His mother and two younger siblings sleep on the bed. Dalia Hartstein gets a warm welcome from Hermes and his family. His mom made us delicious injera (traditional Ethiopian food) and insisted that we eat more and more. She served each of us three cups of coffee because she told us that in Ethiopia it is customary to drink three cups. I had never drunk coffee in my life, but it was very good. They were so warm, hospitable and glad to host us in their home. When we left, his mom gave me a huge hug and told me to send all her love to my parents and family, whom she hopes to see again soon. Those five days were an incredible experience, and this article is just a small taste of what it was like there. Dalia Hartstein is an 18-year-old recent high school graduate who lives in Ra’anana, Israel. She made aliyah from St. Louis with her family in 2004. Her parents are Elisa and Morris Hartstein, and her maternal grandparents are Betty and Malcolm Minsk of Atlanta.